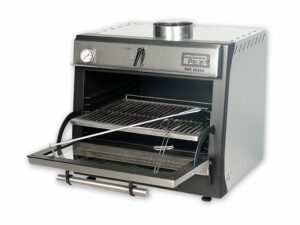 The first of a new generation of charcoal ovens that is revolutionizing the world of catering. 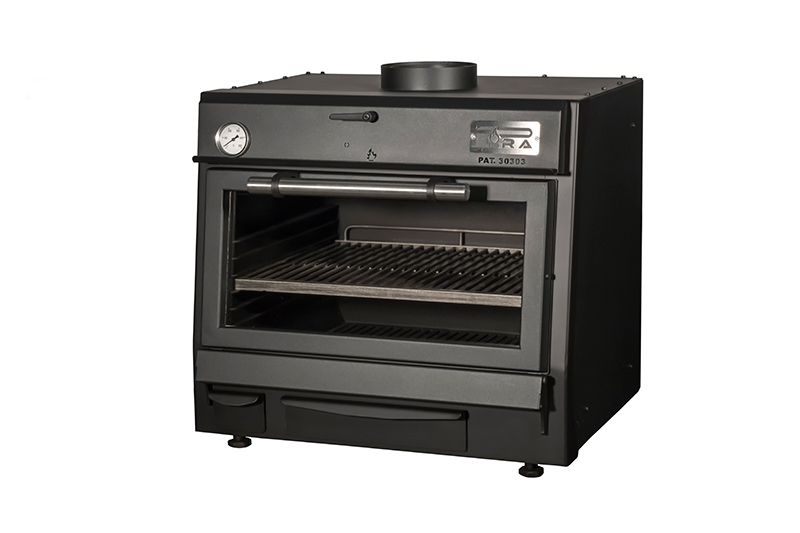 Its features, performance, economy and measures make this charcoal ovens as the most economy, profitable and preferred by chefs for its comfort. 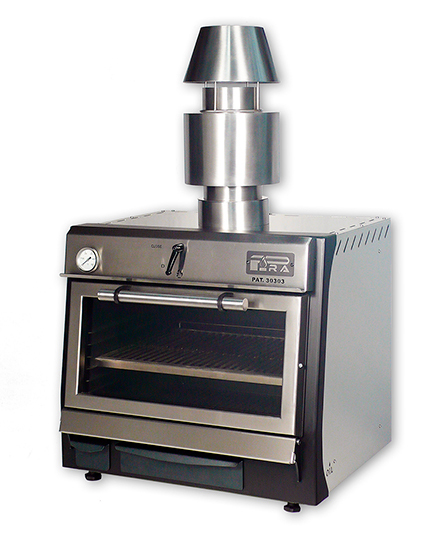 This is the first worldwide oven incorporating PIRACOLD. 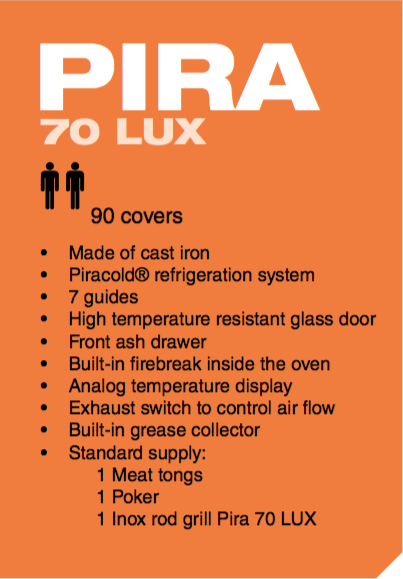 When the oven reaches its maximum operating temperature, the oven outside structure is maintained around 70ºC. The temperature inside the cooking chamber is maintained for hours, even after the service is finished. 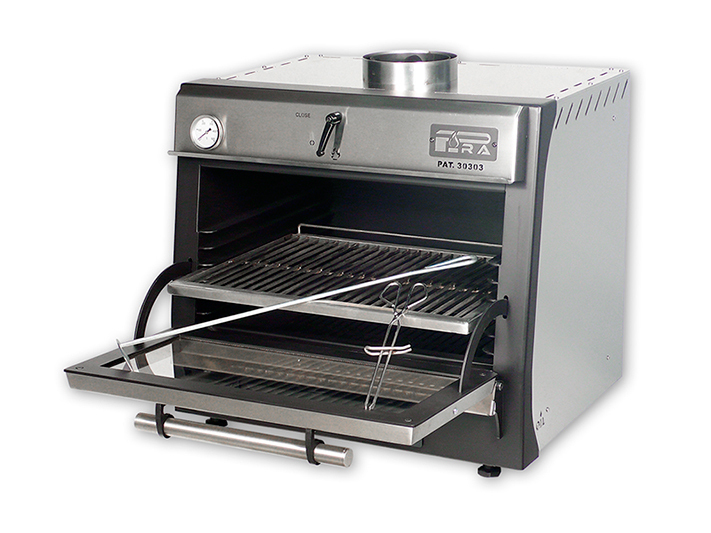 Thus, although production is equal that other oven with the same dimensions, this oven saves energy and money; because of there is a very low charcoal consumption. The same amount of charcoal can be used to cook up to 25% than an charcoal oven without PIRACOLD. 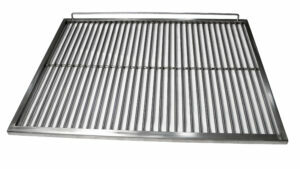 It is ideal for small / medium establishments or for restaurants where the grill is an additional line in the menu. All kinds of food can be cooked: meat, fish and vegetable. The oven is fitted with a high temperature glass door, that will withstand temperatures up to 750ºC allowing you to view the food whilst cooking, this helps to maintain oven temperature and reduces charcoal consumption. Glassdoor allows you to view products being cooked – this means you don’t have to keep opening the door so maintaining the oven temperature and helping to reduce charcoal consumption. 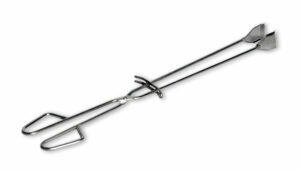 Fitted as standard with internal Air flow control and Firebreak – prevents fire exiting the oven and going into the extract canopy. These devices can be supplied as well in an external version. 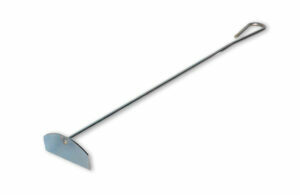 Supplied with 1 stainless steel grid 585 x 465, 1 x meat tongs + 1 x poker. Can be supplied in Black version, or can be finished with a stainless steel version. 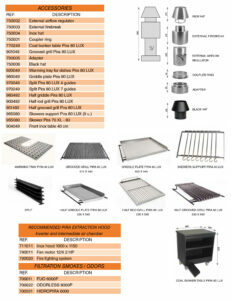 Possibility to cook with grooved grill 515 x 470 that allows you to cook without fear of flames and fires in delicate foods (fishes, some vegetables) or greasy foods (chicken, duck …).